Three stories told in mostly one-syllable sight words for beginning readers introduce yet another odd-couple pair of animal friends. Each chapter uses just 40 to 50 words of conversation between two invertebrate friends who share the roles of dimwitted innocent and slightly bemused foil. First, Snail talks to a rock named Bob, prompting Worm to introduce a stick named Ann. In the second tale, Worm cheers Snail's triumphal conquest of a flower that bends almost to the ground under its weight. 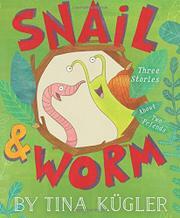 In the third story, Worm's attempts at description are tripped up by Snail's overactive imagination. Snail imagines a terrifying spider as Worm describes a lost dog without ever using the word “dog.” Unfortunately the quirky, animation-inspired illustrations do not match either Worm's description or Snail's imaginings, leaving readers clueless and just as confused as Snail when Worm's pet appears. The final twist, that Snail's pet is a “dog” named Rex that is clearly a spider, will puzzle rather than amuse young readers. The underlying problem with all these tales is that the humor is exceedingly understated and dependent on a sophisticated sense of irony; children struggling to decode the text will get little help from the illustrations.